Healing using trance states appears to have been in use in many ancient civilisations including those of Egypt, India and Greece, where the sick would be taken to 'sleep temples' and their condition treated by priests whilst in sleep-like states. The term 'hypnosis' was coined around 1840 by James Braid, a Scottish physician. The word 'hypnosis' comes from the Greek word 'hupnos' meaning sleep. Braid was influenced in developing his work with hypnosis after being introduced to mesmerism, the name given to the healing treatment developed by Anton Mesmer. 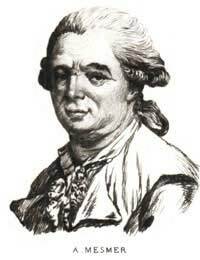 Franz Anton Mesmer (1734 - 1815) was an Austrian physician who believed that all living beings are surrounded by a fluid or ether through which they are able to interact. He termed this ability 'animal magnetism'. Thus, a human being could channel this etheric fluid into the body of another human. Mesmer believed that human distress was the result of an imbalance between a person's animal magnetism and that in the environment. He suggested that another human could redress this in the manner outlined above. Mesmer would channel 'animal magnetism' through his own body by placing his hands on the affected part, or by giving the patient an object or iron bar to hold that he had previously 'magnetised'. Those who subsequently used Mesmer's methods became known as magnetisers. Mesmer appears to have had a fair degree of success with his methods. With a charismatic personality, his healing sessions had an air of theatricality about them. He would often stare into his patients' eyes whilst touching whatever body part needed healing. Creating an air of drama, many patients would have cathartic experiences in which they released long-held emotions. Watching the visiting magnetiser, Braid was convinced that what he was witnessing was a natural phenomenon. Noting that the subject had gone into an altered state of consciousness, he concluded that this had happened because the patient fixed his gaze on a bright object the magnetiser was holding in front of him. Braid experimented with inducing this altered state himself, and concluded that continued fixation of the eyes caused what he termed 'a nervous sleep', that is fatigue in the relevant brain centres, similar to but not the same as natural sleep. Braid made extensive use of hypnosis in his medical practice attempting to treat a wide variety of conditions. One of the most interesting ways in which hypnosis came to be used around that time was in surgery. The Scottish physician James Esdaile, who worked for many years in India claimed to have carried out in excess of 300 operations with his patients in hypnotic trance, apparently without any pain being experienced. The advent of chloroform as an agent for anaesthetic virtually brought this use of hypnosis to an end. After Braid's death, interest in hypnosis within the medical profession, with the exception of a few notable individuals, waned. One of these was the French neurologist Jean-Martin Charcot who expounded its use in the treatment of hysterical patients (hysteria denoting certain psychological characteristics). Thus, interest in hypnosis progressed to the psychiatric community. Freud himself used it for a number of years in his own practice, developing a method of encouraging patients to relive stressful experiences in trance with the full expression of emotion. Thanks to the continued work of certain individuals and the publishing of various books, the British Medical Association commissioned a special enquiry to investigate the value of the use of hypnotism in medical practice. As a result, in 1955 the BMA stated that all postgraduates training in psychological medicine should be instructed in the clinical use of hypnosis, and that all undergraduates should have access to information on it. Whilst the extent to which medical schools train their students in the use of hypnosis is limited, the BMA's endorsement has probably done a great deal in promoting its acceptance by the general public. Hypnosis is a state of awareness and not a treatment in itself. Today, we refer to therapy carried out in hypnosis as hypnotherapy. An individual who has done the most to make the practice of hypnotherapy what it is today is Milton Erickson, a doctor and psychiatrist. His study of human nature coupled with his genius led him to devise treatment protocols which are extensively emulated by hypnotherapists the world over. Today, whilst there are doctors who work with hypnosis, it is mostly lay practitioners trained at dedicated schools who work with hypnosis. Hypnotherapy draws together techniques from a wide range of psychological disciplines, and it is this coupled with the ability to work directly with the client's unconscious mind through the use of the hypnotic state that makes it the powerful treatment it is today.